"I really want the GT-40 but it doesn't come with a roof rack. Oh wait..."
GT-40 hands down... how can you even ask that question....... now maybe.. just maybe.. if it was a restomod Jag E-Type.. then it would be a competition. With the Jag, you could take your new girlfriend (who only likes you for your car) along for a bike ride, where as with the GT-40... you'd forever be a bachelor. Bikes and cars are cheaper than divorces. Of course, once snow was on the ground, with either car you'd be taking the city bus. Throw a pair of snow tires on and you are fine, the Jag I think is all wheel drive, and snow tires on a rear wheel drive works fine too (I had a AMG C63 through 6 winters, and I know a ton of guys in Canada who had AMGs through the MB forums). In fact, with snow tires, any car is fine. 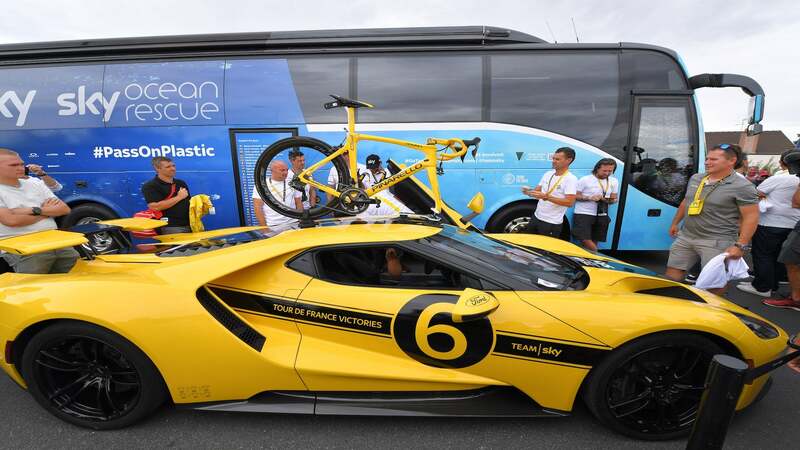 The problem is the roof rack... it appears to only haul 1 bike on the GT-40. Does Pinarello make a tandem? It's not a roof rack.. I believe it is this. Basically uses suction cups to hold it to the roof. just slide the bike over to the side instead of the middle and you can fit another. What's with the dating/mating pop-ups?